An acronym for Oriented Strand Board Sheathing, an intermediate layer of engineered lumber consisting of compressed wood strands bonded together with resin and used to attach siding to a building. 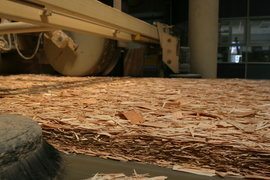 OSB is more uniform than plywood, can be manufactured into larger panels, is considered more environmentally friendly, and doesn't delaminate like plywood in hot climates. On the other hand, plywood is lighter, easier to work with, and puts less stress on the construction. OSB sheathing is more economical than plywood (approximately $700 less for a standard 2,400 square foot home).